The Free Application for Federal Student Aid (FAFSA) process can be confusing and overwhelming. Our resident FAFSA expert, Chris Bradford put together some helpful hints about the application, tax implications and the process to provide FAFSA information for you. There is no income cut-off to qualify for student aid and many factors are taken into account, including family size and parents’ ages. Even if you think your family’s income is too high to qualify for student aid, apply anyway! The Expected Family Contribution (EFC) is your family’s financial position and is determined through a mathematical formula. Your household’s taxed and untaxed income, assets and unemployment or Social Security benefits are used in the calculation. Other factors included are your family’s size and the number of family members attending college in the year. When you submit the FAFSFA, you are not only applying for federal aid, but also state funds and some school funds. 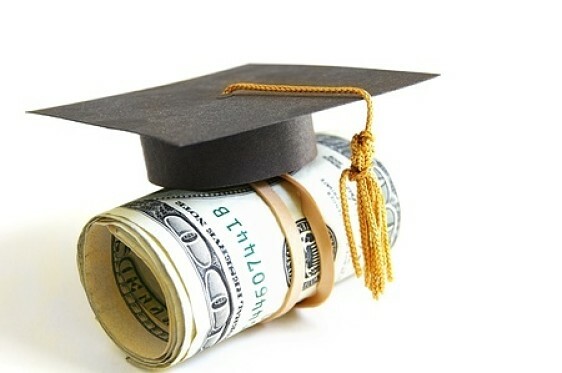 If your college student is interested in applying for university scholarships, the university may not even review his or her application until the FAFSA form is submitted. True or False: If parents do not claim their child a dependent on their tax return, that only the student’s income would be considered when determining financial aid. FALSE! There are questions on the FAFSA that determine if a student is indeed independent and does not need to report his or her parent’s financial information. Generally, students are considered independent if they are over age 24, working towards an advanced degree, married, have dependents receiving more than 50% of their support from the student, both of the student’s parents have been deceased since the student was age 13, an emancipated minor, in active duty with the military, or a veteran. The FAFSA review process considers students and parents differently. Colleges expect up to 20% of students’ asset to be used to help pay for college, while only about 5.64% of parents’ unprotected assets are considered. What are protected and unprotected assets? When parents are separated or divorced, the custodial parent (the parent with whom the student lived for most of the year) is responsible for completing the FAFSA form. The custodial parent’s information is included on the form, and if the custodial parent remarries, then the step-parent’s information is also reported on the form. 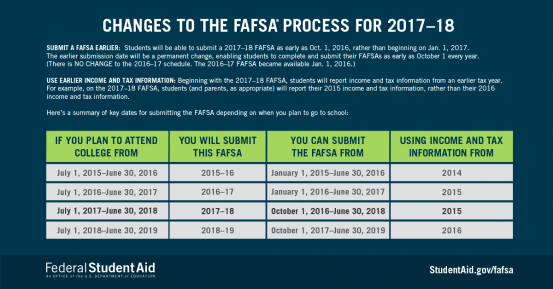 New regulations allow students to submit the 2017-2018 FAFSA in October 2016, instead of January 2017. Also, students will use information from the 2015 tax returns for the 2017-2018 FAFSA, rather than 2016 tax return information. This infographic includes the updated deadlines for filing the FAFSA. We know there is a lot of information about the FAFSA process, and it can be confusing, but we are here to help. Contact us today with your FAFSA questions!